Yes...it has been since late August since I've been out with my camera on a Trek. I have had a very good reason for that though. You see, I have been steadily getting further and further out of shape since my activity level has dropped, so I went out and got another bike. I've been concentrating on getting my weight down, and working on my cycling once again. After three months of intensive training, I'm back better than ever and its time to stretch the legs of the tripod once again. I've been wanting to get out for the past few weeks, but the time and weather just haven't been working in my favor. This set of days off, however, I decided that I was going to go out one way or the other. The weather for today was rain, off and on with solid clouds above. This seemed like it might work out for some waterfall pictures. 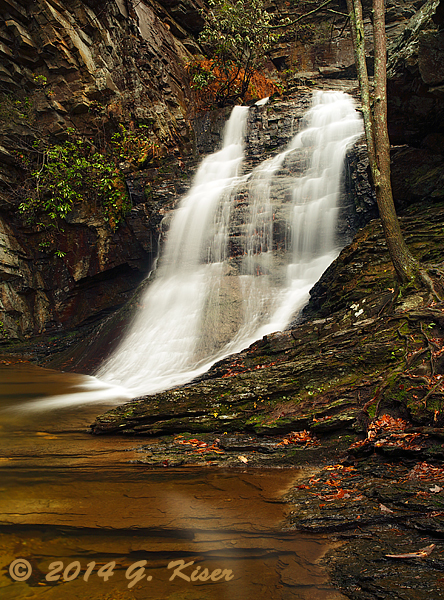 Of course, I had a lot of options about where to go and what to shoot when it comes to waterfalls. The catch is, most of the waterfalls I like to visit are hours and hours away from home. Not wanting to be on the road all day long, I opted to go to Hanging Rock which was only about 40 minutes from home. There are five main falls in the park, but I decided to concentrate on the Lower Cascades because I just wasn't quite satisfied with what I came back with the last time I was there. The entire ride to the park was rainy. It was not a steady downpour or anything, but there was enough in the air that I was going to have to take that into consideration when I was setting up the camera so I didn't get the front element wet. I was happy that I remembered to bring my hat which doubles as a lens shield in light rain. I was hoping that the rain would keep the crowds down to a minimum while I was there, and it appeared to have done just that. When I arrived, there were only two other vehicles in the parking lot. As I was hiking to the falls, they were on the way out. I was going to be all alone, and that was a very good thing. When I made it to the waterfall, I was pleased that the water flow was pretty good. There was plenty there without being overpowering. The rain was my biggest issue at this point, and I chose to work my way to the far side so I could use the rocky ledge to provide a bit of cover for me. This seemed to work pretty well, and I was able to get several vantage points under cover from where I could shoot the waterfall. 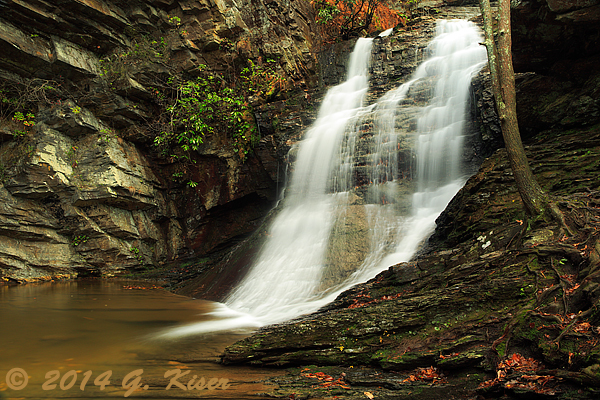 The Lower Cascades is an often photographed waterfall at Hanging Rock and one that I have worked from many different angles before. On this visit, I wanted to play around with some different shots. 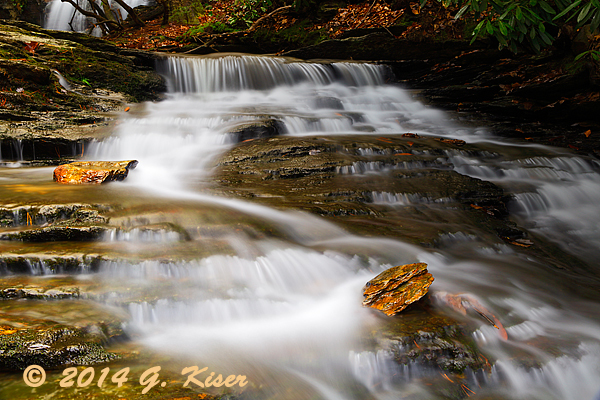 The first that I tried appears directly above and makes use of the landscape to frame the water. 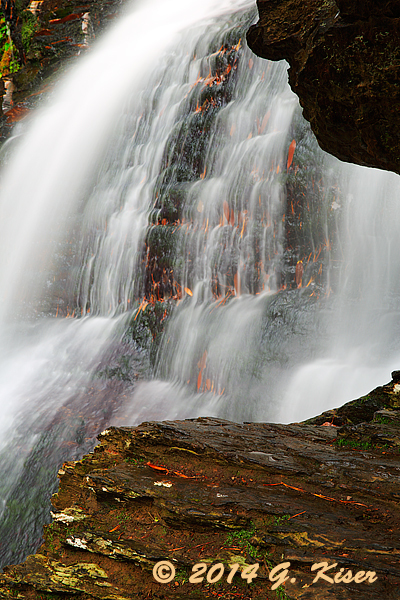 I normally try to keep the full waterfall visible, but I kind of like the peeking from behind aspect of this shot. The contrast between the dark shadows and the bright water help to give the picture a degree of drama as well. In continuing with my goal for different shots than I normally take, I went in for a close up of the water framed in the nice texture of the rocky ledge. I was still able to stay out of the rain for this shot which made it even better for me. The idea here is the juxtaposition of the flowing water against the static rock. This shot is all about extremes and I think it turned out really well. Plus, if you look at it long enough, you start to see the lower portion of a face leaning in to look at the water. Its all about visual trickery here. I couldn't pass up the opportunity to grab some of the standard shots from this waterfall as well. With the rain reduced to a fine mist, I was able to leave my shelter and work some locations that have been too deep in the water the last few times I have been here. With the water levels down a bit today, I had a lot more available options from which to stand. This is one of the more classic views of this waterfall. 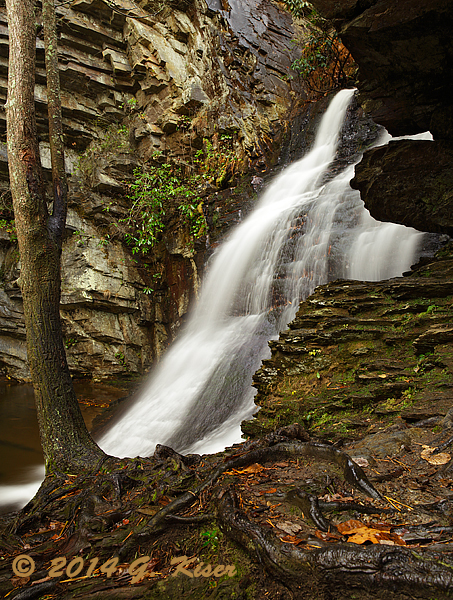 The flowing water seems to be mirrored by the rocks to the right, leading up to the tree. Everything works in unison here, and is contrasted by the more horizontal aspect of the wall to the left. 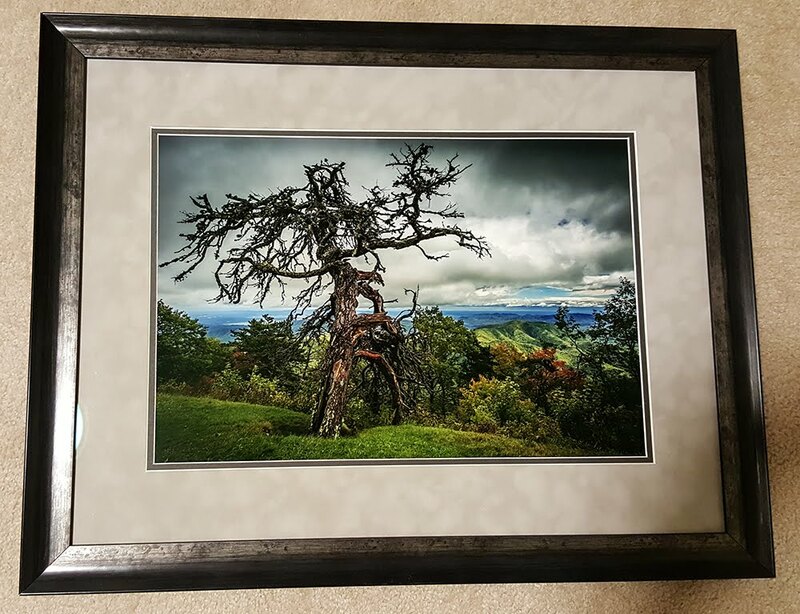 The vegetation provides a splash of color here and there as well, which makes for a nicely balanced piece. While this is the more typical shot of the falls, I actually liked it better today in the portrait orientation as seen in the lead piece A Silent Whisper. The more intimate depiction suits the flow of water and the lighting better in this situation. I would have liked to have worked this location a bit longer, but the rain was falling a bit too hard to be out in the open. It was time to move to some cover. The cover that I was after was in the form of overhead trees. It would provide enough deflection that with my hat over the lens, I should be able to get a few more pictures. The secondary cascades here are usually just as impressive as the primary, but if the water flow is heavy, it is very difficult to get into position to capture it. Today, there was a perfect amount of water on this section. There was enough that the white water was very pronounced, but not so much as to flood the whole area. As a bonus, there were a couple of loose rocks with a nice reddish color to them which were perfectly spaced along the path of the water. The composition really worked itself out on its own because of these focal points. After just three exposures, the rain was coming down too hard to continue without fear of equipment issues. It was time to pack it up and start back to the truck. I found a sheltered area and broke everything down, wiping it down before I put it back in the bag. The rain was coming down even heavier at this point and I knew I had made the right decision. I started the long climb up the steps back into the woods along the trail. As I got deeper into the trees, the rain began to be less and less of a problem. Because of this, I started to search out other options to photograph before heading home. 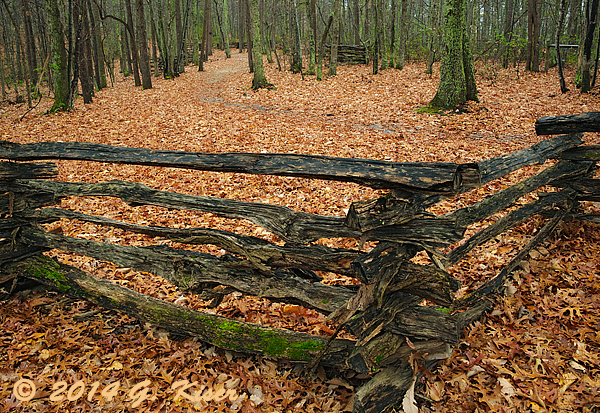 There was a nice section of trail where they had built a split rail fence alongside which has always caught my attention in the past. Today was no different, only with the rain, the colors were super saturated and I decided that I was going to try and find a composition that suited it. Ironically, the composition that I found that made the most sense was on the back side of the fence looking at the trail itself. This was the least disorganized view I could find. There was just enough of the trail exposed beneath the leaves that you can follow it through the picture into the trees in the distance. The aged wood of the fence is the story here though, and what I wanted to capture the most. I was lucky that I was able to get a corner where the wood overlaps and goes in two different directions. The diagonal lines from this play nicely with the verticals of the trees in the top portion of the frame. Because of the rain, there was a good bit of inherent contrast to the scene which otherwise would not have worked as well. I was glad that I stopped and gave this subject a try today. After spending a short time with the fence, the rain started back with a vengeance. It was time to pack it in and head home. Fortunately, I wasn't too far from the truck and within a few minutes I was back in the cab and headed back home. The rain kept coming down increasingly hard reinforcing the fact that I had made the right decision to head home. I had been wanting to try either Hidden Falls, or the Upper Cascades when I was finished with the Lower Cascades, but they will have to wait for another time. At least I have quite a few pictures from both of those waterfalls which I still enjoy to this day. From the day, I ended up with 35 frames, of that I have found 6 that I am keeping. Considering how long its been since I've been out with the camera, I have to say, I've very impressed with that ratio of keepers. Its in line with what I have come accustomed to with other Treks.